Mornington George Giles, was the eldest son of Mr and Mrs Albert Henry Giles, Radnor Cottage, 8, College Gardens, lost his life on HMS Queen Mary during the Battle of Jutland. He was a Boy 1st Class and was killed only a month after joining the navy. Before joining up in April 1916 he was employed at No 9 House, The College. He was an old boy of the Wyche. HMS Queen Mary was the second Battle Cruiser to be lost during the Battle of Jutland at 4.15 p.m., two hours after the first contact was made. She took a plunging salvo on the upper deck, which caused a huge explosion in one of her magazines. She sank with her stern high in the air, and left a towering pillar of smoke. 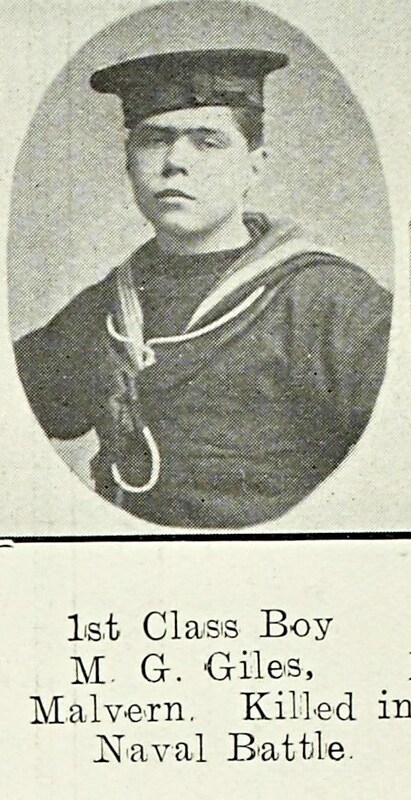 Ernest Crouch from Malvern was also lost aboard HMS Queen Mary.